Like words, graphics and images can be powerful tools – but they must be used with great care to enhance, not detract from, your content marketing and branding. Unfortunately, as visual content grows in popularity and inexpensive tools make graphics and images easier to create, many marketers churn out mediocre visual content that gets ignored by the very people it was supposed to influence. Even worse, some marketers post confusing or poor-quality images that don’t look like they’re from the same brand or meet audience perceptions of the brand. Martin Shervington, a consultant, speaker, trainer, and coach on all things Google Plus and the community manager for Plus Your Business! 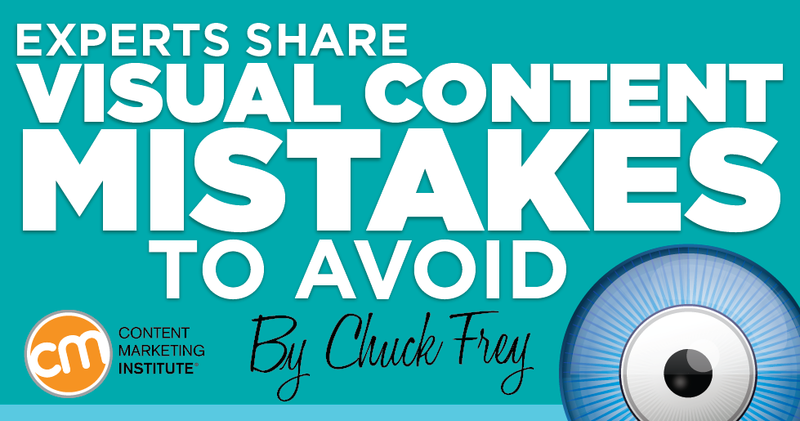 What are the biggest mistakes marketers make with visual content? “Your visual strategy should not only be a reflection of your brand, but embody it. A visual strategy is what brings your brand to life in all of your interactions and online engagements,” Biedermann says. Too often, marketers get enamored with creating striking images and forget about what they’re trying to accomplish, Moritz warns. “What do you want your fans to do when they view your image? Marketers need to think of their visual content as a doorway to great information. It’s not about just catching the attention of fans with visuals but having them take action on your content,” she explains. 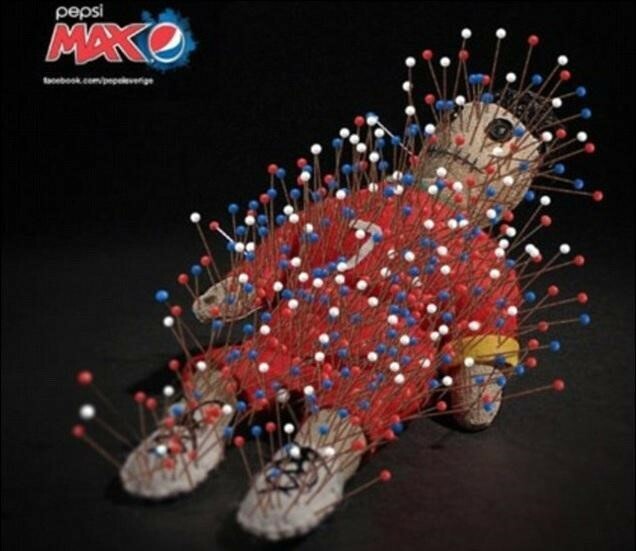 The Swedish-based division of Pepsi-Cola may have fallen in love with this attention-getting image of a voodoo doll resembling Portugal’s soccer superstar Cristiano Ronaldo that it used in a series of Facebook ads in 2013. Ronaldo’s fans and his team were not amused. Pepsi was forced to issue an apology. Another common mistake is creating a single graphic or visual treatment to use across all social platforms. Every social network has specific guidelines and constraints for graphics. Each one spells out image sizes and other parameters that enable them to appear in their optimal form on many types of devices. Yes, it’s time-consuming to create a separate optimized image for each social network. But if you want your images to perform well, you must tailor them to each channel as much as possible so that they can be presented without being cut off or distorted. 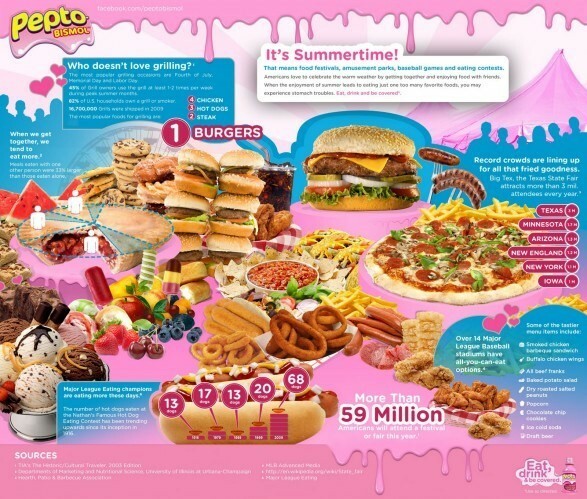 Pepto Bismol gave in to the sin of excess by trying to cram way too many visuals and too much text into this cluttered infographic. Another frequent faux pas made by marketers is inconsistency: They post infrequently or publish clashing images that don’t look like they’re from the same company. This approach can cause confusion and do more harm than good, Biedermann says. “A weak, conflicted, fractured presentation is the death knell for standing out in today’s extremely busy media environment. Only by presenting a strong, unified brand across all media touch points does a business stand any hope of gaining the traction it needs to be seen and understood,” he adds. Another common mistake is neglecting to properly brand images, which helps audiences to quickly identify the image’s brand source. “Add your company name, logo, website address, and other important identifiers to your images. Maintain your brand’s look and feel by consistently using its colors, fonts, and graphics,” Radice says. What are more effective approaches to these challenges? Shervington recommends taking a bigger-picture view of your visual content: “Think storytelling. Take people on a journey through your content, linking each element back to another. Visuals can make content fly, but you need to know the direction in which you want it to go, and where it can land. Engagement for engagement’s sake is a rookie error,” he says. 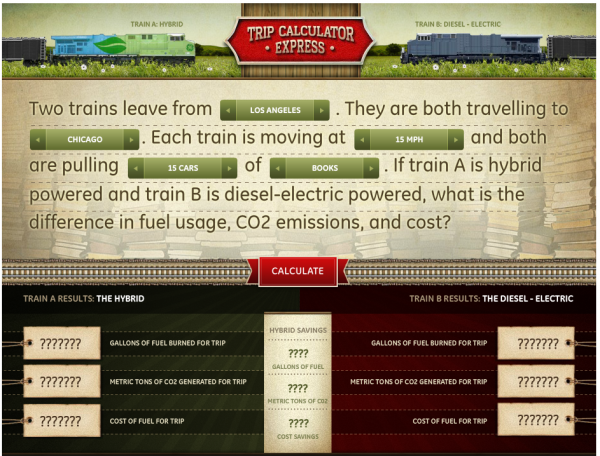 GE Transportation created this engaging, interactive trip calculator to demonstrate how much fuel its new hybrid railroad locomotives can save versus conventional diesel-electric locomotives. Moritz is a big believer in looking at your visual content from the perspective of your target audience, especially if you’re not convinced that it needs to be tailored to each social media network. “It’s important to step back and understand the nuances of each platform to see what type of content works best natively on that platform. Take off your marketer hat and step into the shoes of your fans. Then you will see that the styling and message of your visual content must vary from platform to platform,” she advises. Your fans already know they like their own images so why not use them? 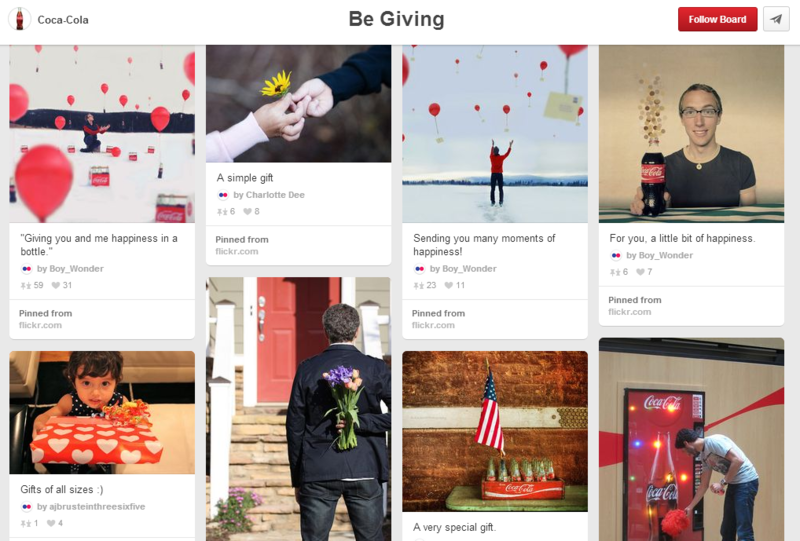 Coca-Cola’s Pinterest boards deliver on its promise of “Discovering moments of happiness, one picture at a time.” The global soft drink producer cleverly solicits user-generated images via its Flickr page, which it then repurposes for its engaging Pinterest boards. Consistent use of the color red helps reinforce its brand. Starbucks’ visual marketing program makes extensive use of user-generated content that shows its products in visually creative ways and people enjoying the products. In this example, Starbucks has transformed eight customer-submitted images to create a Facebook cover collage. Loeffler predicts that marketers and community managers will need to cultivate graphic design skills if they hope to respond to the increasing need for real-time content: “The ability to conceive, design, package, and showcase your visual content on the fly is the next set of skills that social media practitioners will need to possess,” she says. In other words, you can’t just conceive an idea for a piece of visual content and throw it over the wall to your graphic designer. This iterative process is simply too time-consuming in today’s real-time social media environment. Marketers must wear many hats in today’s tough business environment, making it tempting to focus on quick and easy image creation rather than taking the time to create the quality images that your target audiences expect. A growing number of free and low-cost image-creation tools make it easier to satisfy this need for speed. In other words, it’s OK to use these inexpensive tools, but your graphic designer should create templates to help speed image creation and keep marketers on brand. Designers also should create detailed guidelines on the proper use of logos, color, type, and other visual elements. Do’s and don’ts need to be clearly spelled out to enable your visual content creators to develop a consistent brand experience for your target audience. But isn’t this time-consuming? It can be, but Diamond shares a clever way to make time for it. “Look at what you’re doing in your business and eliminate something that has no impact on the bottom line. Magically, time opens up when you strategically eliminate things that are not valuable to your audience or your business,” she says. What questions should content marketers ask themselves to get the best visual content results? Is this content worthy of creating a visual? Answer before you create it. What graphics and visual assets appeal to our target audience and resonate enough to be highly shared? Do the assets we plan to create adhere to our brand’s graphic identity standards? How can we provide useful solutions and helpful hints and tips through graphics? What do we actually want people to do with this content? What action do we want them to take? Should we include a call to action if that’s important to our campaign goals? Are you nurturing your visual and graphic skill sets so your brand remains competitive and relevant in the visual content space? Need some help creating unique, impactful images, infographics, videos and other visual content formats? Why not try out one of these 27+ tools for better visual content marketing.